Hey everyone, I have a baby card to share with you today. This is a clean and simple with dimension. Hope you like it. Here is the card for you. I really love how this card turned out. Although this was not in the plan while making the card. I wanted to make a baby card and use In a Word: Baby cutaway. Also I wanted a subtle background and a dressed up Baby Cutaway. So after going through the stash, I picked Lola's Bouquet stamp set to dress the Baby Cutaway. I stamped the floral images and leaves using Altenew Pink Diamond and Bamboo inks on the Baby cutaway. I also die cut three more Baby cutaway using pink cardstock. Then I stacked and glued the three pink die cuts with the stamped die cut on top. For the background, I used Creative Screening Madison and sponged Hickory Smoke distress ink lightly to get subtle pattern on a white panel. I used the same In a Word: Baby cutaway to die cut in the middle of the background panel. I adhered the negative panel on a white card base. Then I inlaid the stacked dimensional Baby die cut on the panel. 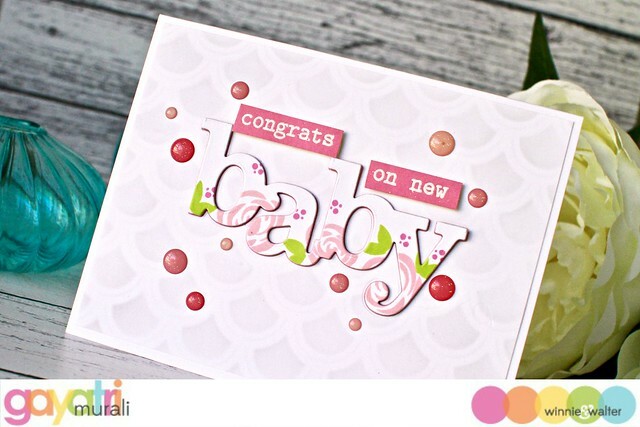 The secondary sentiment from The Big, the Bold and Baby stamp set is white heat embossed on a strip of white cardstock and sponged with Pinklicious ink to tie in with the pink colour on the Baby dimensional sentiment. The sentiment strips are trimmed and adhered as shown using foam adhesives. To tie in all the pink colours on the card, I added three shades of pink sparkly enamel dots from Doodlebug Cupcake Sprinkles. I absolutely love the soft colours and lots of white on this card. All supplies used to make this card are listed below. 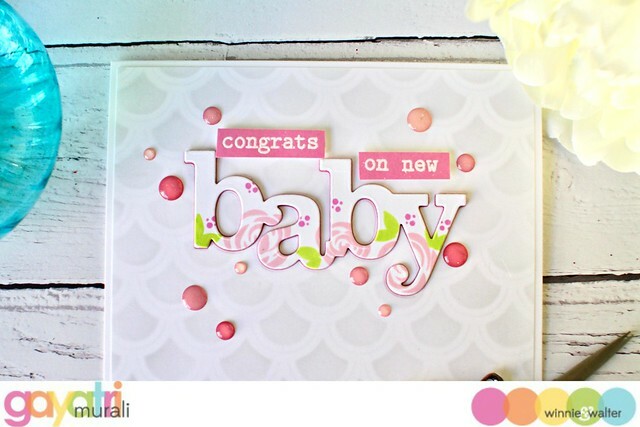 Hope you got inspired and share with us if you recreate this card. That’s such a sweet card design ! !